World 3- Castle is the castle of World 3 in New Super Mario Bros. 2. It is a water-themed castle cramped with dangerous Grinders that attempt to hinder Mario. The boss of this level is Wendy O. Koopa. Mario begins on a platform which is being circled by a Grinder. This is followed by two ? Blocks, one of them with a Super Leaf. This is followed by more Grinders bouncing from their tracks. A Bone Goomba follows. This is followed by more Grinders and a section where Mario has to climb up orange platforms while avoiding the Grinders. At the top is a door leading to the next area, where the checkpoint can first be found. Another ? Block containing a Super Leaf can be found. The next section features many Grinders and large Grinders on tracks along the path. There is a mini pipe which leads to a hidden area with two ? blocks, one with a coin, while the other with a Super Star. Then Mini Mario must wall kick and touch the Grinders to defeat them and get extra points. Another Super Leaf can then be found. A Bone Goomba can be found, followed by more large Grinders in an area with platforms that move up and down. This is followed by the boss door. The boss here is Wendy O. Koopa, whose battle takes place on a long orange platform with water below. Her attacks are mainly water-based. She can cause the room to be filled with water in which state Mario cannot attack her using jump moves, but with fireballs. Blowing her whistle causes Cheep Cheeps to swim in the water from each pipe, or cause them to jump out of the water below when it is dry. To defeat her, Mario has to stomp on Wendy's head three times when it is dry, or use Fire Mario or Gold Mario to attack her at any time. Star Coin 1: The first Star Coin can be found enclosed by a Grinder in the section where Mario climbs up orange platforms. One way to obtain it is to activate a hidden block with a 1-Up Mushroom below the Star Coin by hitting it from a small orange platform, then jumping up from there. Otherwise, Mario should wait till the Grinders are not obstructing him and then jumping to the Star Coin. 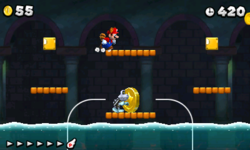 Star Coin 2: The second Star Coin can be found after the checkpoint right after the section with giant Grinders, being guarded by a single Dry Bones on a platform with Grinders coming from the water. Star Coin 3: At the boss door, the player must look for a hidden block on the right wall. They should climb up that block to reach a ledge leading to the Star Coin. This page was last edited on April 13, 2019, at 08:48.